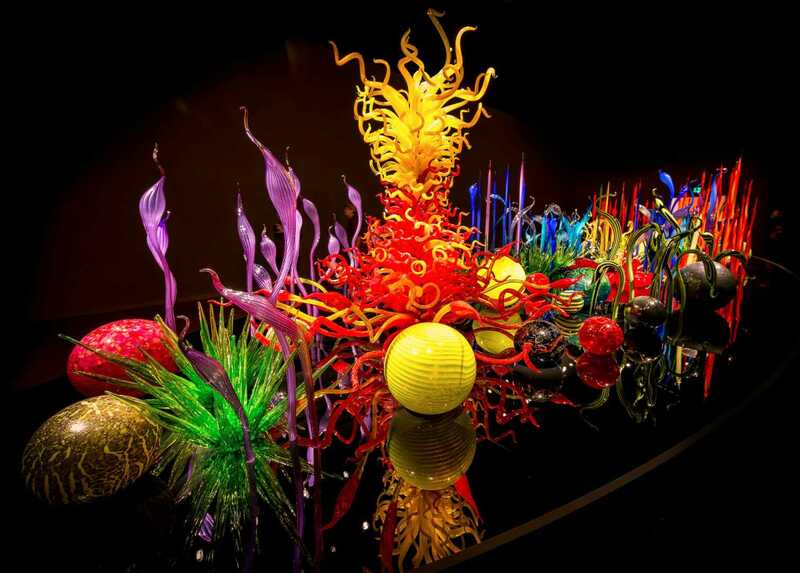 Born in 1941 in Tacoma, Washington, Dale Chihuly was introduced to working with glass while studying interior design at the University of Washington where he graduated in 1965. He enrolled in the first Glass Program in the U.S. at the University of Wisconsin and then continued studies at the Rhode Island School of Design where he later established the Glass Program and also taught the course. Subsequent to being awarded a Fulbright Fellowship in 1968, he worked at the Venini Glass Factory in Venice and in 1971 he co-founded the Pilchuck Glass School in Washington State together with Anne Gould Hauberg and John H. Hauberg. His work is exhibited in more than two hundred museums worldwide and he has received many awards including twelve honorary doctorates and two fellowships from the National Endowment for the Arts. He has created many well recognised works, among them Cylinders and Baskets in the 1970's, Seaforms, Macchia, Venetians, and Persians in the 1980's, Niijima Floats and Chandeliers in the 1990's and Fiori in the 2000's. In 1986, he was honoured with a solo exhibition, "Dale Chihuly objets de verre" which was mounted at the Musée des Arts Décoratifs, Palais du Louvre, in Paris. In 1995, he began Chihuly Over Venice, for which he created sculptures at glass factories in Finland, Ireland, and Mexico and then installed the pieces over the canals and piazzas of Venice. In 1999, he began an ambitious exhibition, Chihuly in the Light of Jerusalem which was visited by more than one million visitors to the Tower of David Museum. In 2001, the Victoria and Albert Museum in London curated an exhibition, "Chihuly at the V&A". He also exhibited at the Royal Botanic Gardens, Kew, in London in 2005.